The Goddess Chronicles ended yesterday morning with the publication of the last book. I have loved writing every single story in this series, and I wanted to take a moment to thank you for supporting it. I’ve received messages and wonderful reviews, and I’m so glad a silly, well-meaning goddess earned your love. The publication story for this one is both a little crazy and a little rocky. I started writing at a very young age, but one of my more serious attempts was a blatant rip off of Danielle Steel’s Message From ‘Nam. It’s one of my favorite books and I decided that, well, if Danielle could do it, so could I! This was, of course, in high school, when you think you’re ten foot tall and bulletproof. At the time, our high school had a wonderful librarian who let me use the old computer in there after hours. I wrote the “book” and saved it on a floppy disk. Yes, I’m old. I had delusions of grandeur and that book now resides in a notebook viewed by no one else but me. Life got in the way of my budding author career, as it tends to do quite often. I joined the military at the tender age of 17 because I had no money for college, and my grades had slipped enough over my junior and senior year to preclude me from scholarships. Home life and all that. So the writing stopped and my life became the military. Then came marriage and kids and writing seemed to be nothing more than a dream I once had. But dreams don’t often stay only in your head. They can be realized with enough drive and hard work. After fifteen years in the military, I realized I had finally had all the fun I could stand. I’m not a person who makes decisions lightly, so I thought about it for well over a year or two. I remember walking into my supervisor’s office (she is still a good friend of mine) and telling her that not only did I want to get out, I wanted to write a book and get published. And then we laughed and laughed and laughed. But in 2011, I got out, pursued a Masters degree, and wrote a silly Valentine’s Day flash fiction piece which won first place and netted me $25 bucks. Small potatoes but a kernel of hope ignited in me. That was the very beginning of Abby. I turned that piece into a book, attended my first Romantic Times Convention, and placed that book into the American Idol Contest there. It became a finalist, and I got my first real taste of both public embarrassment and critique. Having someone read your work in a room full of a couple hundred people is honestly quite terrifying. But overall, the feedback was good. I took that book, reworked it, and sent it off to a handful of publishers. It was picked up immediately by a small press co-owned by an author I really admired. I won’t go into a lot of detail, but about two years later, after a vigorous fight, I had the rights to those books returned, and I entered indie publishing. Cue crazy town. Nine books later, Abby remains one of my favorite series, and had I not fought for those books, I wouldn’t be here today, nor would you have been able to read her adventures to their conclusion. So, from the bottom of my heart, thank you! I have a lot more books in store for you. At the end of April, the first book in my Deadicated Matchmaker series comes out. I hope you stick with me because I have lots more stories to tell! 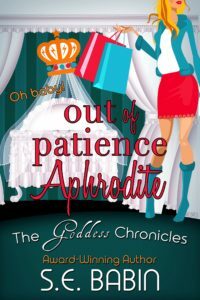 Out of Patience Aphrodite, the last book in The Goddess Chronicles series, is available on Amazon in the Kindle Unlimited Program.